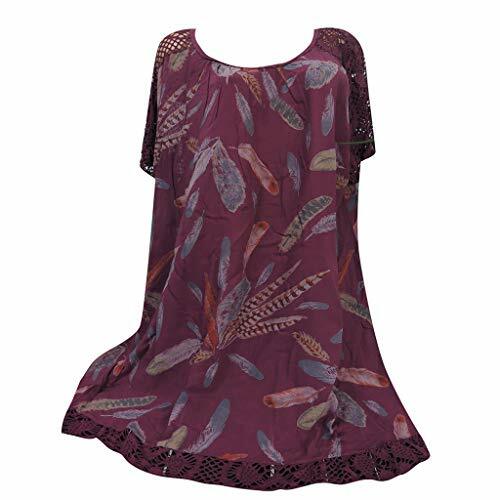 Size: S US: 4 UK: 8 EU: 34 Bust: 90cm/35.4" Length: 67cm/26.3"
Size: M US: 6 UK: 10 EU: 36 Bust: 96cm/37.8" Length: 68cm/26.7"
Size: L US: 8 UK: 12 EU: 38 Bust: 102cm/40.1" Length: 69cm/27.1"
Size: XL US: 10 UK: 14 EU: 40 Bust: 108cm/42.5" Length: 70cm/27.5"
Size: XXL US: 12 UK: 16 EU: 42 Bust: 114cm/44.8" Length: 71cm/27.9"
Welcome to TnaIolral Store, TnaIolral is a fashion store that focuses on Good value for money. As long as you have any needs, I will give you 100% satisfaction! 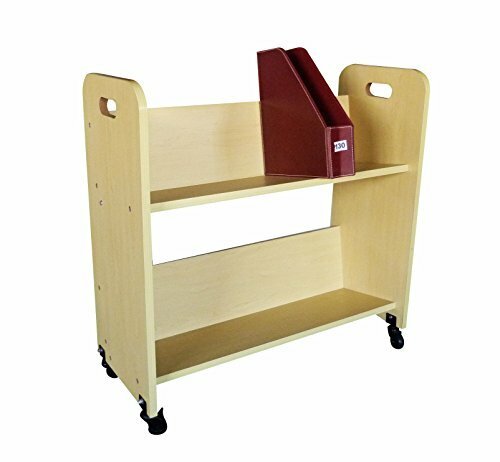 Scoot Double-Sided Book Cart features 6 slanted shelves to carry manuals, binders, folders and files to keep books mobile and organized. Constructed with commercial-grade, perforated steel, this mobile cart's designed to last a lifetime. 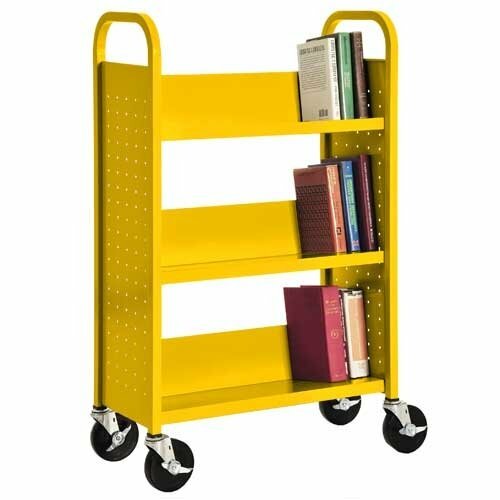 The sturdy book cart includes a powder coat finish to help resist chipping and scratching while the oversized swivel wheels allow for easy movement. This versatile cart is designed for use in an office, collaborative space, library, classroom, home office, church, bookstore or any space that needs organization for essential documents and literature. About Scoot Scoot is a diverse family that includes desks, standing-height desks, bookcases, lecterns, credenzas, file tubs, printer stands, presentation carts, mail carts, multimedia carts, utility carts and book carts. All products are complementary and can be used together to help create a cohesive, professional working environment. Scoot products feature a unique hole pattern design and are constructed of Black steel with Silver accents and a powder coat finish for added durability. Most products include an adjustable side pocket for additional file storage. Created to provide convenient space-saving solutions for a variety of workspaces, Scoot is great for use in home offices, small offices, personal workspaces, classrooms, computer labs, libraries, mailrooms or a variety of other spaces. MOBILE CONVENIENCE. 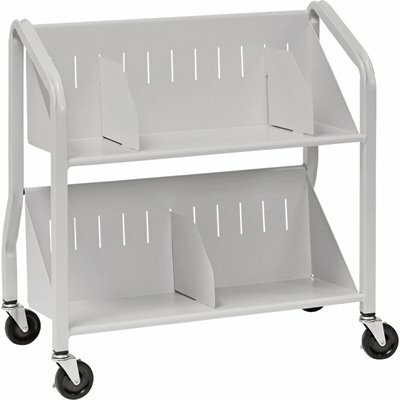 Scoot Double-Sided Book Cart carries manuals, binders, folders and files to keep your literature mobile and organized. 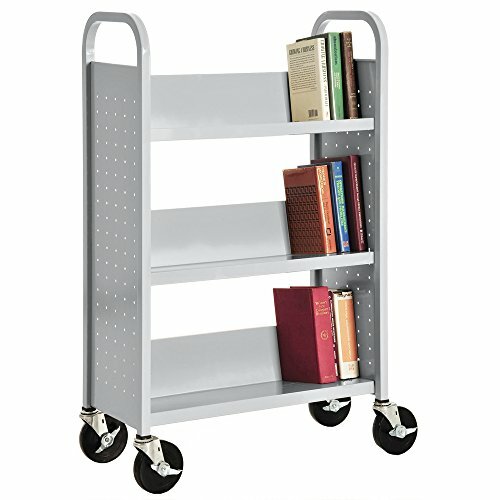 Steel cart features six slanted shelves to hold books in place, swivel wheels for easy rolling and a height-adjustable pocket. DURABLE STEEL ASSEMBLY. 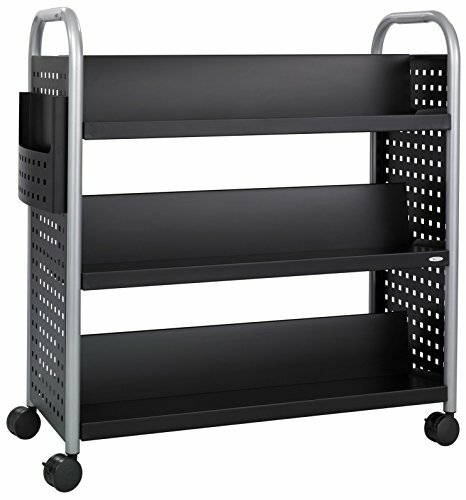 Manufactured with commercial-grade, perforated steel, the cart can handle years of daily use. Durable powder coat finish helps resist chipping and scratching to maintain its professional appearance. 6 SLANTED SHELVES. Dual-sided document cart features six 8D slanted shelves with 12 between each shelf to handle larger books and binders with ease. EASY ROLLING. Four oversized swivel wheels allow easy movement in hallways, offices and meeting rooms. Two of the wheels lock to keep the cart in place when not in use. PRODUCT DIMENSIONS. Overall product dimensions: 41 1/4W x 17 3/4D x 41 1/4H. Weight capacity: 300 lbs. total; 50 lbs. per shelf. is a fully welded, solid book caddy. Smooth rounded edges ensure snag-free safety. This book truck is designed for heavy use in libraries, classrooms and other institutional facilities. It accommodate books, papers and reports and keeps these materials in place with flat shelves. 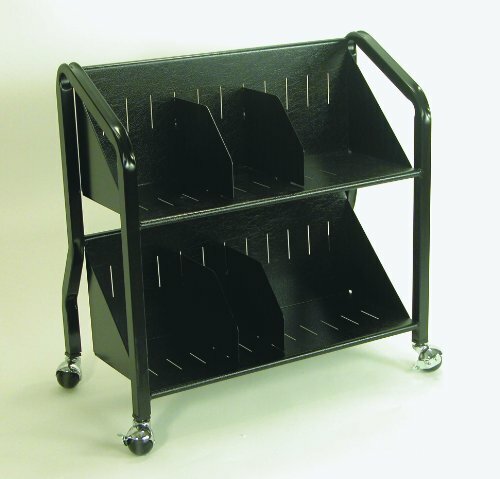 Book carts feature quiet mobility with easy rolling casters, all have locking brakes. 3 Single-sided Flat Shelf,with 12.6 clearance between each shelf,perfect for larger books and materials. 4 Large Locabke Wheels, rolls smoothly over a variety of flooring and locked easily when needed. Definitely hold as many books as will fit on the shelves and still easily roll around. Great addition to libraries, classrooms and other institutional facilities. Can also be used as a bookshelf in home. Buddy Products is a family-owned, privately-held company located in Chicago, Illinois and has been in business for more than 45 years. As an innovative manufacturer and marketer of office supplies and furniture, Buddy Products is committed to providing quality products at competitive prices. This Two-Shelf Book Cart from Buddy Products has sloped shelves to prevent materials from sliding off. It's great for transporting and re-stacking books, and perfect for schools, libraries and offices. The powder-coated steel construction offers added durability. 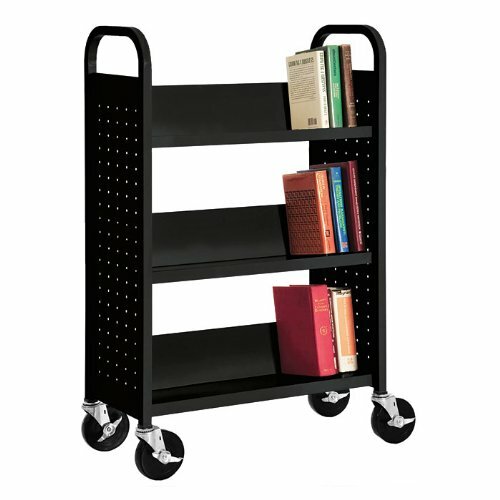 It features four 2-inch casters to make transporting and shelving books a breeze. Buddy Products combines quality construction with affordable pricing to create everything professionals need to maximize productivity and organization in the workplace. Storing and transporting resources is simple with the three-shelf Narrow Book Truck, a substantial addition to your library! The three roomy shelves securely hold books of all sizes and keep literature accessible to even the youngest readers. This Book Truck has a smaller footprint to fit within any library or office. The powder-coat finish is resistant to chipping or corrosion and suited for organizing, storing, and transporting bulky books, reference materials, and binders. The quiet-rolling 4" industrial rubber wheels swivel and lock for sturdy control and smooth mobility. 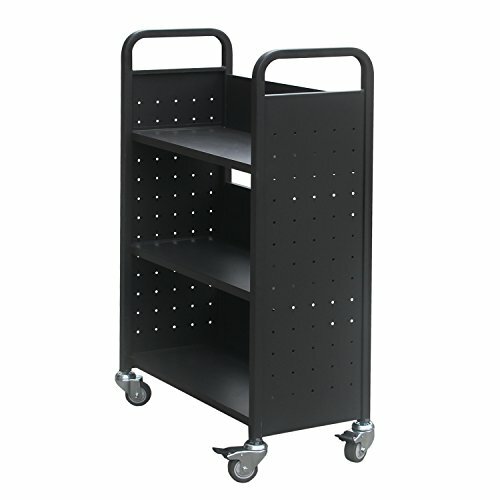 The three-shelf Narrow Book Truck is available in black and dark blue colorations. Ships flat-packed, ready to assemble. Assembled dimensions: 47"H x 28"W x 13"D.
Ships flat-packed, ready to assemble. Assembled dimensions: 47H x 28W x 13D. 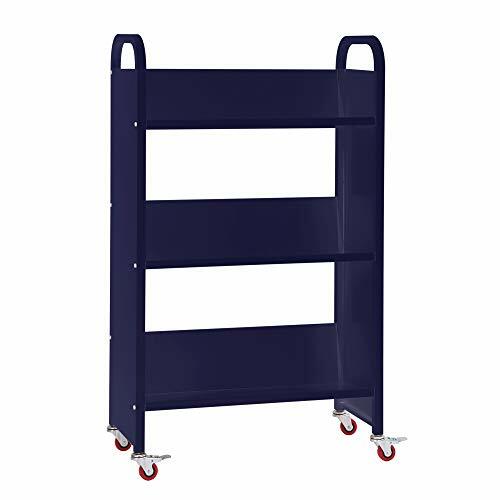 The Sandusky SL327-01 is a welded steel book truck with casters, three single-sided sloped shelves with 12" clearance between each shelf, and a 200 lb. 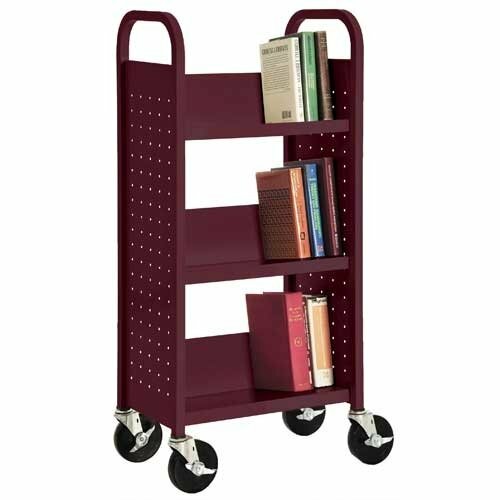 capacity when the weight is evenly distributed, and is suited for organizing, storing, and transporting books, reference materials, and binders, among others. The frame is made of 18 gauge steel and the shelves are made of 20 gauge steel for strength and to resist denting. The book truck has end panels with U-shaped handles, and two swivel and two fixed 5" casters for control and maneuverability. The casters are made of polypropylene to resist high temperatures, corrosion, and wear. 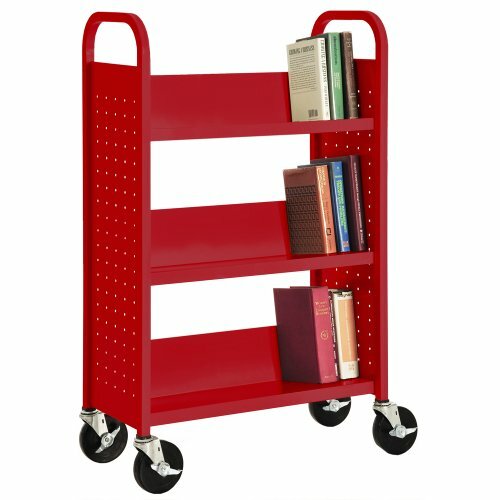 This book truck has a powder coat finish to resist chipping and corrosion. It is commonly used to organize, store, and transport books in law offices, schools, and libraries, among others. The unit, with casters, measures 46 x 28 x 14 inches (H x W x D). (H is height, the vertical distance from lowest to highest point; W is width, the horizontal distance from left to right; D is depth, the horizontal distance from front to back.) Some assembly is required, instructions are included, and tools for assembly are sold separately. Utility carts, also known as service carts, are used for securely storing, organizing, and transporting equipment, supplies, refuse, and materials. They are suitable for use in industrial, manufacturing, and maintenance applications, as well as in the home. This sturdy cart is made from maple melamine laminated MDF. Measures 32" wide by 30" tall by 13" deep. Features two angled shelves for easy storage and display. Heavy duty casters for ease of mobility. Lower shelf is 15" tall and both shelves are 8.5" deep. Shipped flat with easy to follow instructions. Offshore buyers please contact us for freight details. Lading weight on each shelf is 50 lbs. 4 ea of 2 Casters, 2 with brake and 2 non brake, each castor weight bearing capacity is 70 lbs. Total 280 lbs. The replacement caster buy from - With Brake: https://www.amazon.com/dp/B06ZZMHKCL , No Brake: https://www.amazon.com/dp/B071YD9NXR . Size: 0-2 Cup: 30A/30B/32AA/32A/32B Bust: 72-80CM/28.3"-31.5" Waist: 60-66CM/23.6-26" Hip: 78-85CM/31"-33.5"
Size: 4-6 Cup: 32C/32D/34AA/34A/34B Bust: 80-88CM/31.5"34.6" Waist: 64-70CM/25.2"-27.6" Hip: 85-91CM/33.5"-35.8"
Size: 8-10 Cup: 34C/34D/36A/36B Bust: 88-95CM/34.6"-37.4" Waist: 68-74CM/26.8"-29.1" Hip: 91-97CM/36.8"-38.2"
Welcome to TnaIolral Store, TnaIolral is a fashion store that focuses on Good value for money. As long as you have any needs, I will give you 100% satisfaction! In the pool you need to be different from others, you will be more attractive with it! Welcome to TnaIolral Store, TnaIolral is a fashion store that focuses on Good value for money. As long as you have any needs, I will give you 100% satisfaction! 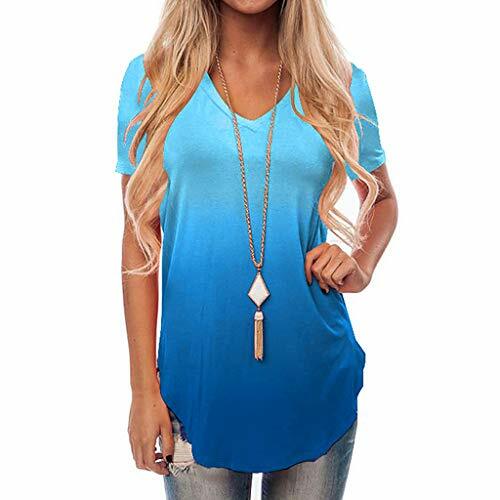 Perfect Match with your favorite shorts, leggings, black slacks, denim jeans, etc.